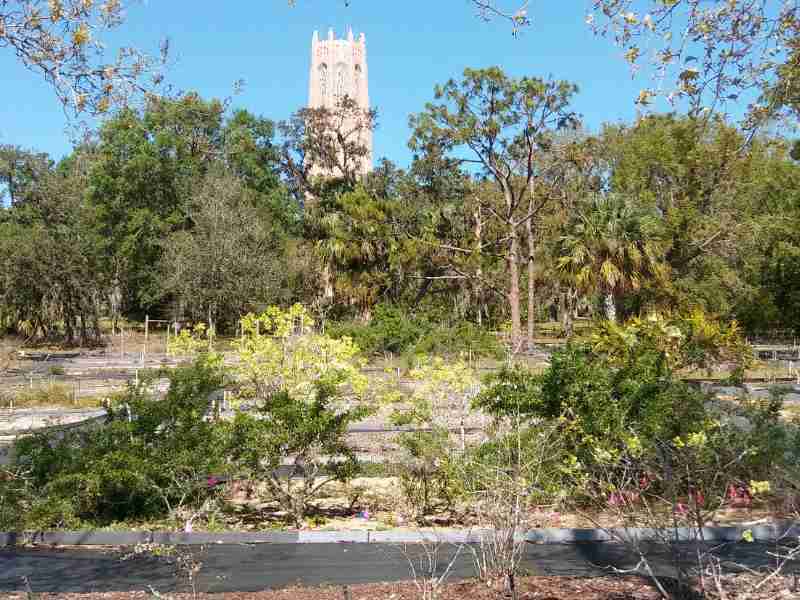 Bok Tower Gardens is home to the Rare Plant Conservation Program. Tasked with preserving the genetic diversity of Florida’s flora, they work with some of the rarest plants in the world. Cheryl Peterson doesn’t wear a cape, and she can’t fly or see through walls, but the work she does is super heroic nonetheless. Cheryl is a Biologist and conservation expert with the Rare Plant Conservation Program at Bok Tower Gardens. Every day she is on the front line, saving oft-overlooked species from extinction. She was kind enough to share with us a little bit about the work she does. Cheryl works to understand and prevent the extinction of plants that are listed as endangered or threatened at the state and/or federal level. Some of the plants she works with can be found in the Endangered Plant Garden at Bok Tower for visitors to enjoy, but much of the work Cheryl does is behind-the-scenes or off-site in the wild populations. When a habitat is endangered, not just the plants are threatened, but the animals are as well. Birds, reptiles, amphibians, and more rely on these ecosystems to maintain their survival. Working towards preserving a habitat puts an umbrella of protection over all those threatened species. Many of the plant species Cheryl works with occur in just one small area within the state. For example, she works with plants found only on the Lake Wales Ridge or only on the Atlantic Coastal Ridge. There’s no real way to translocate these rare species because they are so specialized to the natural environment inherent in their region, and moving them outside of their historical range can introduce other issues, such as hybridization with other species. One species in particular has had quite a success story though. The Ziziphus celata was a native Florida plant that was thought to be completely extinct, until a few small clusters were discovered in 1984. It occurs right around Bok Tower Gardens in the sandhill habitat, as well as into Highlands County. The populations were small, with just a few plants in each. Although the plants flowered profusely, they were not producing fruit or seeds. With no new plants emerging, the populations were declining. That’s where Cheryl’s program came to the rescue. The Rare Plant Conservation Program brought individual plants into the National Collection at Bok Tower Gardens. The Ziziphus was not forming seeds in the wild and the plants were located on private property, so it was important that the plants be brought into the collection. For years Cheryl’s team took root cuttings in order to establish living specimens in the National beds. The reason the Ziziphus was not producing fruit in the wild, as Archbold Biological Station discovered, was because the plants were obligate outcrossers, meaning they could not pollinate within themselves or their own relatives. The genetics were simply too similar in each population for them to be able to reproduce. Fortunately, the different populations were different enough from each other that they were able to cross pollinate. Consequently, Bok Tower Gardens is the only place in the world where the Ziziphus produces seeds. The Rare Plant Conservation Program is part of a larger organization called the Center for Plant Conservation (CPC). Members of the CPC preserve the genetic material, the germplasm, of the rare plants in their region. Fairchild Tropical Botanic Garden, located in Coral Gables, is the only other Florida-based institution in the CPC. The Rare Plant Conservation Program is therefore tasked with preserving the genetic diversity remaining within the listed plant species in most of the Florida peninsula as well as the panhandle. There are about 535 listed plant species in Florida. Another responsibility of the Rare Plant Conservation Program is to survey proposed development sites to see if there are any endangered plants that will be destroyed and that can be rescued instead. Cuttings and seeds may be taken in order to save the genetic material from those species. Right now there are about 4,000 plants and over two million seeds being preserved in the collection. The entire Program consists of just three people, and is nearly entirely grant and donation funded. Cheryl Peterson is the Conservation Program Manager, and she is assisted by a Rare Plant Curator that oversees the National Collection and a Conservation Biologist who oversees many of the projects. Much of the work of the Program relies heavily on volunteers, both at the Gardens and throughout Florida. If you would like to learn more about the Rare Plant Conservation Program, simply visit BokTowerGardens.org and click on the “Conservation” tab. You can also find information on becoming a member or volunteer of Bok Tower Gardens, a National Historic Landmark located in Lake Wales.